Did you ever take C. S. Lewis’ test for pride? He counseled that if we want to know how proud we are, just ask yourself…”Self, how annoyed do you get when anyone else is showing off or butting into your territory?”. Well, not his exact question…but his thought! The point is, we get annoyed with someone else being controlling, demanding, and self-advancing…because…we are. Pride causes division in human relationships…but also between humanity and divinity. The person who is always pushing others down, so that he can be above; is not going to be lifting his eyes up to The Eternal Perfect. Wouldn’t that self even avoid The Eternal Perfect, since it would cause self to wither in contrast? 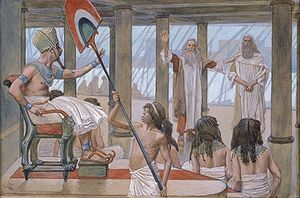 As I meander after Moses on my broken road to grow in faith, I am presented with contrasting personalities in this area of pride; Pharaoh, who “refused to humble” himself before God (Ex 10:3), and Moses, who is presented as more humble than anyone (Num 12:3) and the servant of the Lord (Deut 34:5). With every contact Pharaoh has with the Lord he becomes harder set in his pride, while with every contact Moses has, he responds with growing faith. A meandering disciple can grab hold of a principle here. Faith is opposed to pride. So what does this Pharaoh-heart-that-I-must-beware-of, look like? It not only looks down on others by being critical and fault finding, it must have its own way and be demanding about it. It is confident in how much it knows and thinks often of what it can do for others…and God. It is driven to prove that it is right and should be appreciated, recognized, and listened to. It is quick to blame others, to correct others and slow to ask forgiveness because, after all, it doesn’t want anyone thinking it has any spiritual needs. It doesn’t recognize its own condition. What does a Pharaoh heart look like to you? Did you take action against it? What heart medicine did you apply? I’d love to hear from you. This entry was posted in Meandering with Moses and tagged Christianity, Egypt, faith, learning from the Bible, Moses, Pharaoh, pride, wrapped up in one's self. Bookmark the permalink. Whenever one person becomes self-absorbed and -important, the body starts to become sick. I can’t bear to see believers scrambling for the spotlight or bickering over doctrine or even having personality conflicts…thank you for this post! “The body starts to become sick.” You paint a very descriptive word picture for us of how pride infects the Body of Christ. Unfortunately, I often carry the disease and do not recognize the symptoms until there is an outbreak. It is a chronic condition that I must continually tend to. My meanderings after Moses are prompted by great need. Blessings to you. Many thanks for a wonderful post, Mike! Many welcomes for your blessing of thanks!. MT is extremely kind to let me write for his blog, he is a great source of encouragement to me. Thank you Mr. Eric…I am not positive of the accuracy, but the original thought behind the title is often attributed to Benjamin Franklin. The Truth is, of course, the Lord’s…for all truth is God’s truth. Thank you for the smile. I had to share this. So true. I am blessed that you thought it worthy of sharing. Thank you for letting me know. Blessings to you. Very well written, and so true. Pride, the very sin of Lucifer when he and one third of the angels rebelled against Adonai Himself…yet so many of us Christians have more than the world has of this nasty festering disease. We look at Jesus Christ, who could’ve been prideful against the know-it-alls, who really didn’t know squat, yet remained strong, bold, and humble all at the same time. Nominated you for the very inspiring blogger award. To retreive your award, go here http://lynleahz.com/2012/06/29/reader-appreciation-award/ It is the fourth award down, and follow the directions! Thanks, and God bless you! Thank you for the kind consideration. Oh, guilty, guilty, guilty, I plea, to this particular type of self-involvement! So THIS is why that button is so easily pushed by others! Hooray for your help here today. Praise Be to God! Hooray for the Lord’s help here today! Hooray that He fleshed out humility for us, so that we too can die to self. Thank you for bringing us this praise moment…wa-hoo!!! Blessings. Excellent word and reminder…to guard our hearts. Blessings! Thank you for the encouragement blessing Susan. I am sorry to report that the reason I can remind anyone else, is because I must constantly remind myself that pride divides. This is great…Pride is so very sneaky. It can manifest in so many different ways. So, it is important that we stay open. And consistently do a heart check. Thanks for this post. Thank you so very much for taking the time to reply, your words add much to the post. “Pride is so very sneaky. It can manifest in so many different ways.” Yes, yes. That is so true…and because of that we often don’t recognize the green eyed monster when we encounter it staring us in the mirror! I love your phrase “do a heart check”, that should be a part of my daily routine! Blessings.